The cargo ship MV Rozen is heading for harbour when it is hijacked by Somali pirates in the Indian Ocean. Among the men on board are the ship’s cook Mikkel (Pilou Asbæk), who along with the rest of the seamen are taken hostage in a cynical game of life and death. With the demand for a ransom of millions of dollars, a psychological drama unfolds between the CEO of the shipping company (Søren Malling) and the Somali pirates. A Hijacking is filmed under realistic conditions. The crew filmed in secret in pirate filled waters in the Indian Ocean on a freighter which itself had previously been hijacked and with a real professional negotiator in a central role. French, Phillip. "A Hijacking – Review." The Guardian. The Guardian, 12 May 2013. Web. 04 Dec. 2014. Marianetti, Rick. 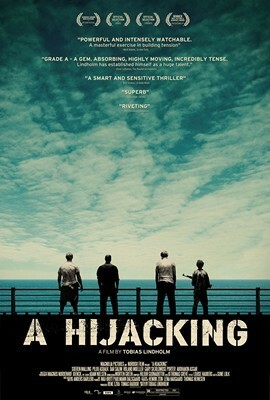 "Tobias Lindholm's 'A Highjacking' Combines More Suspense with Less Action." Examiner.com. Examiner, 20 June 2013. Web. 04 Dec. 2014. O'Connell, David. "20/20 Filmsight - Film Criticism by David O'Connell." A Hijacking Film Review. 20/20 Filmsight, 17 Sept. 2013. Web. 04 Dec. 2014. This film is purchasable at Amazon. The film also has its own website in addition to social media outlets like Instagram and Facebook.